Some things get better with age. Morrissey is just getting more erratic. 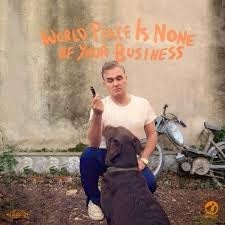 His new album, World Peace Is None Of Your Business is a testament to that. It's been five years since he releases the tepid Years of Refusal, and while the music has improved, the thought process of the lyrics is wackier than ever. The title track is a melodramatic number, with a sound as grandiose as it's title. It's message is a warped 'if you vote, then you're supporting what's happening in X place'. So in reality Morrissey suggests you just drop off the grid so you can wash your hands of any responsibility. That's some backwards logic. "I'm Not a Man" is an overwrought nearly 8-minute opus that rambles both musically and goes over the top with it's animal rights theme ('t-bone steak, cancer of the prostate'). While suffering from a similar lyrical ailment, "The Bullfighter Dies" is at least packaged in a more appealing pop (biodegradable) container. The fuzzy guitar crunch of "Neal Cassidy Drops Dead" is striking in comparison to most of what's on the album. A deep deep bass groove makes a powerful impact on "Istanbul". The title of "Kick the Bride Down the Aisle" gives one a lot of hope for a classic Morrissey/Smiths tongue-in-cheek pop song. Instead we get a slow-moving, mean-spirited snoozer. The crazy politics of Morrissey's lyrics could be accepted if they came wrapped in a pretty (or at least more engaging) bundle. Instead of poppy, catchy tunes or cutting edge tension, we get mostly drawn out unimaginative arrangements on this record. That's the real reason why this is a failure. Best tracks: "The Bullfighter Dies", "Istanbul"